Collecting and preserving memories was a central motif in Walter Kempowski's work. For almost 50 years, he passionately indulged in an activity that he called "fishing for plankton". He asked people he met a wide variety of questions – about their schooldays, about meeting celebrities, about the first time they fell in love. Kempowski did this because he was convinced that the experiences of one person were typical of a whole generation. Simone Neteler worked with Walter Kempowski for many years and has compiled these splinters of memory according to the instructions of the author, who died in 2007. The result is the "fountain of memory", "the mud from which The Echo Sounder and The Chronicles arise" (Walter Kempowski). 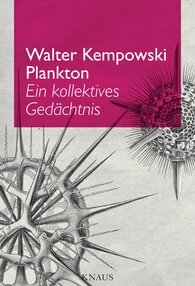 Thus Plankton must be seen as the foundation of Kempowski's work.